A couple months ago Ms. Cindy came to me looking for a solution. 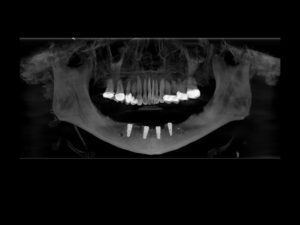 She had lost the majority of her posterior teeth when she was younger, had limited bone in the posterior, and periodontal disease in her lower anterior that was causing some severe mobility. Given the longterm prognosis of her lower anteriors we decided to do a 4 implant overdenture. Step 1 was to extract the lower remaining teeth, level the bone for implant placement, and place the implants. With locator dentures I like to cover up the implants and two stage the surgery. 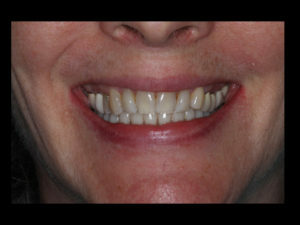 During the four month healing period she wore an immediate lower denture. In this case, we placed three 3.8x12mm Biohorizons Tapered internal implants and one 3.4x12mm implant. After four months we made an incision and placed healing abutments. Sometimes I will at this point measure for the locator abutment height but if you wait a week the tissue heals nicely around the healing abutment and you can get a better reading. So bringing her back we unscrewed the abutments and measured from the top of the implant to the height of the tallest tissue. I did forget to mention that about three months in we made a new final denture using the palodent digital denture system. That way when implants were ready to restore we would do a chairside pickup. The pick up day is always an exciting day because we go straight from a floating lower denture to something that really snaps in. 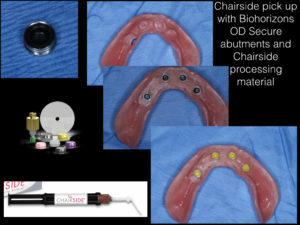 We used the Biohorizons OD secure abutments which I have been super pleased with. The pick up process is a breeze. 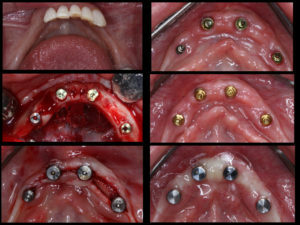 Place the abutments, with pick up caps seen in the top left picture after placing the clear plastic undercut protectors, then relieve the area where the abutments are so the denture seats passively. At this point we used chairside reline material placed in the denture and on top of abutments. This is a dual cured material which is nice. Pop off the black pick up caps, clean up the excess, and place the new retention caps of choice. With four implants we only used the extra soft because Cindy was worried about getting it out. Thats the difference were talking about! Occlusion was checked and adjusted if necessary and off she went. This is one of my favorite procedures because its such a great service to the patient and makes such a big difference in function and esthetics. Any questions feel free to comment! What are the differences between the Biohorizon attachments and Locators? Honestly, there isn’t much difference. They are both locators the biohorizon one is just about $75 cheaper than the zest one. Its been super easy to use and has had just as good of retention. Worth trying for sure.